Welcome to Pest Animal Louisville! We are a wildlife removal company servicing Louisville, KY. If you need a pest control solution immediately, we’re the right people to call. We have a technician working in your area right now, and we can usually guarantee you a same-day appointment. It’s perfect for those emergency situations … Like finding a raccoon going through the garbage can in the kitchen. It’s not just raccoons we can take care of though, we’re also great for getting rid of colonies of bats in your attic, or squirrels, rats, opossums, skunks, armadillos, snakes, you name it. The only unwanted visitors we won’t deal with are bugs and insects. We don’t use poisons or fumigants, you see, we’re pest control technicians, not exterminators. We know they don’t work, and the reason we know that is because we have ten years of experience on our side. We also attend a number of industry seminars, ensure our technicians are fully-trained, licensed and insured to deal with your property, whether it’s commercial or residential. We carry commercial liability insurance to cover everyone involved. Not that you'll need it. Our home-repairs and seal-jobs are professional-grade, so much so that our customers have voted for us to become the number one metropolitan-area pest control company. Our prices are great, get in touch for a free quote or some free pest control advise today! Call us now at 502-996-8856 for your Louisville wildlife control needs. We answer our phones 24/7. Property inspections and in-attic inspections. Nuisance wildlife trapping and removal. We never use poisons! We don't handle insects. 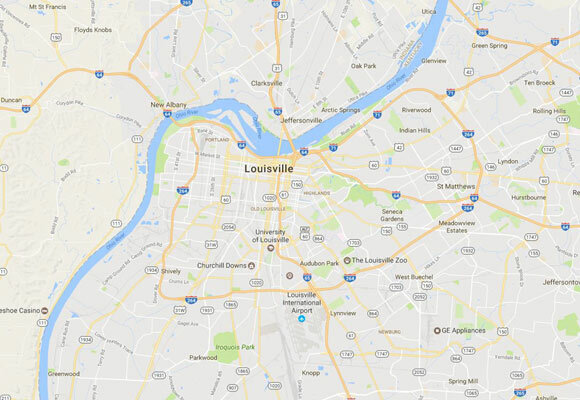 Louisville dead animal removal inside houses. Removing a wild Louisville animal from a chimney should be approached with caution, research and a good amount of knowledge. In the majority of cases, it is recommended to hire an animal removal expert, instead of removing a wild animal on you own. However, there is still need for you to stay informed on the various types o wild animals that might inhabit your chimney, safety concerns that follow and measures of caution you can take to avoid getting in this situation again. The risks of having a wild Kentucky animal inhabit your chimney depend on the type of chimney and the type of animal in question. The first thing you should do if you suspect that a wild animal has nested or gotten trapped in your chimney is to determine the type of the animal and assess the safety risk depending on the chimney type. Gas chimneys that get inhabited by a Louisville animal are a particular safety hazard because the presence of an animal doesn't allow the gas to be released from the chimney properly. Additionally, an animal stuck in a chimney might die due to the effects of the gas smoke, which furtherly complicates the situation. Manufactured chimneys are at risk from collapsing or being damaged from animal chewing or clawing. one way or another, before you start using your chimney each year, you should thoroughly inspect it to see if it's clean and safe for use. You should also unclog and clean any soot or debris from the chimney as much as possible and repair any damage that happened throughout the year. The risk that comes from an animal in the chimney varies significantly depending on the type of the Kentucky animal. Birds often build nests in chimney tops throughout the year, and starting a fire with a birds nest at the top of the chimney is a serious safety hazard. The bird could nest could set on fire and collapse down the chimney, causing a fire in your home. Keep in mind that removing nesting Louisville birds and killing them is also against the law in many states. This is why the prevention is the most important step in keeping birds away from your chimney. The best way to protect yourself from Kentucky birds nesting in your chimney is to install a chimney cap, along with a bird screen. In some cases, you will have to wait for the brood to leave the nest before clean the chimney and install a cap. Bats, mammals with a special tendency to inhabit dark places in a human household are also the species to look out for. Unlike birds, Kentucky bats will often inhabit the inside of the chimney, which makes them an even greater risk. Given that bats are protected by law, you are not allowed to remove them by killing them. In the case of bats, the best thing for you to do is to get a Louisville animal removal expert to remove the wild animal from your chimney. To prevent bats from inhabiting the chimney, you should install a chimney cap along with the top-sealing combination damper. Make sure to repair any mortar joints that bats might have damaged with biting and clawing because these are also a safety hazard. The risk of fire is also worth mentioning in the case of all types of chimneys. In some cases, Kentucky squirrels will also build a nest inside your chimney. Squirrel nests are usually quite difficult to remove due to the size of squirrel nests. In fact, some of the larger examples count up to 15 feet in length of a squirrel nest inside a chimney. This creates a fire hazard, due to the fact that the chimney flue will not vent. The best way to keep a squirrel away from your chimney is to install a stainless steel chimney cover. If you need to remove an existing nest of Louisville squirrels from your chimney, you shouldn't attempt to do it on your own. Squirrels might become aggressive, and could also carry diseases. Can Wild Animals can Destroy the Wood on Your House? What Does Rat Feces Look Like and Where is it Found? Will County Animal Services Help Me with a Snake Issue?